It’s an especially bitter twist for fans of the annual Macy’s Thanksgiving Day Parade. According to the New York Weather Service, the anticipated high temperature will be 27 degrees Fahrenheit, and the low will be 20 degrees Fahrenheit. 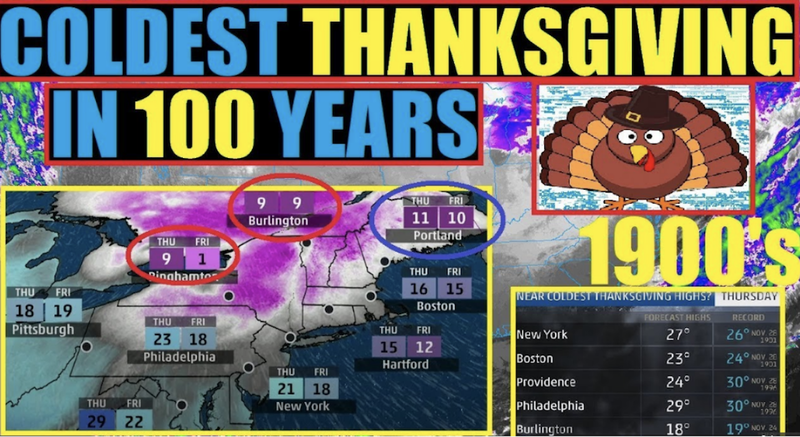 Based on record-keeping that goes back to the 1870s, those forecasts would make today the third-coldest Thanksgiving in modern history. 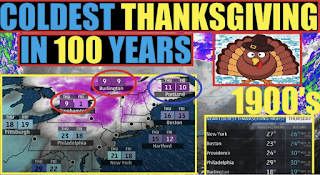 The all-time coldest Thanksgiving occurred in 1871, with a high of 21 degrees and a low of 15 degrees. Winter has arrived much earlier than normal this year, particularly across North America, where cold records have been shattered. This Thanksgiving is in fact going down as one of the coldest ever on record across the Northeast. The Met Office has today released the latest iteration of the official climate predictions that it periodically issues to the country. The last iteration, UKCP09, provided considerable entertainment to climate watchers, after Nic Lewis discovered a major error in the underlying mathematical model, essentially making the entire exercise worthless. The chief scientist at the Met Office at the time, Julia Slingo, actually admitted Lewis’s central point, but unfortunately the country continued to use UKCP09 as if everything was fine and dandy. Letters from GWPF to the government chief scientist Patrick Vallance, and to the CSO at Defra, Ian Boyd, pointing out that it might not be very clever to use a set of predictions that were known to have a fatal flaw brought back responses along the lines of (on the one hand) “the guys are doing a great job” and (on the other) “UKCP18 is coming anyway”. Bureaucracies cannot ever lose face. Anyway, rather than trawl through UKCP18 today, I thought it might be amusing to look at the first iteration of the UK’s climate predictions, which was called UKCIP02, in order to see how the predictions are getting on now 16 years have elapsed from its publication in 2002. Unfortunately, the relevant web pages are no longer available, but I found a report on the subject from the BBC, which gives me enough to work on. 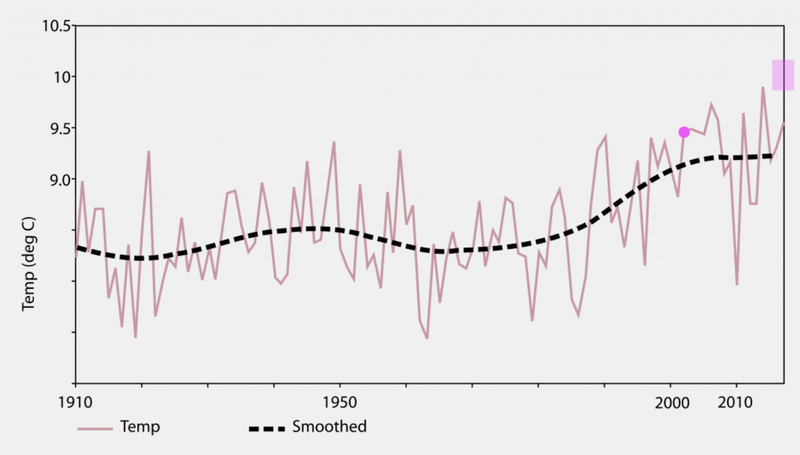 "Annual average temperatures look set to rise by between 2C and 3.5C by the 2080’s." We are now 20% of the way between 2002 and 2080, so you might expect something approaching 20% of that warming to have taken place – in other words between 0.4 and 0.7°C. In fact warming trends are meant to gradually increase, so something just shy of 0.4°C would still represent a good performance by the Met Office predictions. 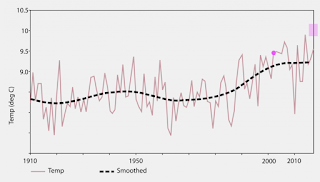 So how have UK temperatures evolved since 2002? 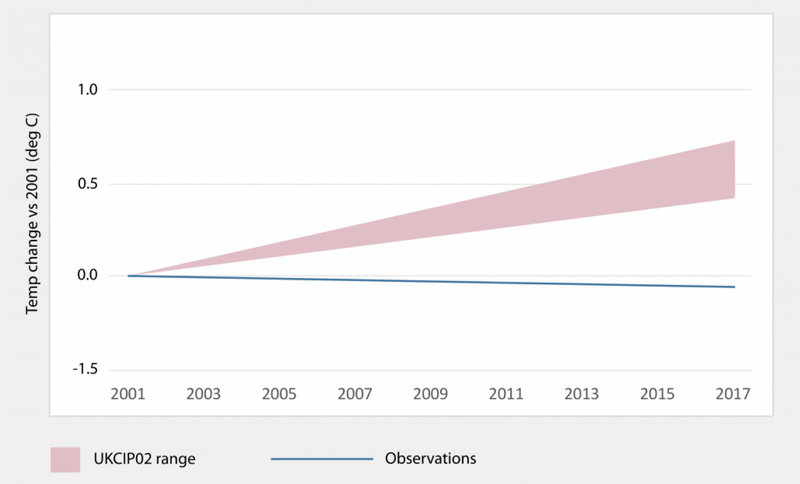 I’ve updated one of the graphs we used for Paul Homewood’s GWPF paper on the state of the UK climate, highlighting 2002 (pink circle) and the 0.4-0.7°C range (pink rectangle). It’s not looking good, is it? 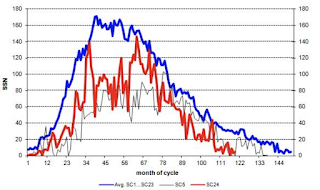 As Homewood points out in his report, UK temperatures have actually been falling slightly since the millennium. At this point, two thoughts occurred to me. Firstly the temperature in 2001, which was presumably when the UKCIP02 predictions were finalised, was considerably lower than in 2002, so my choice of a 2002 baseline was perhaps a little unfair. Secondly though, thoughts about baselining issues reminded me that it’s far better to look at trends, so that the baseline is not an issue. The next graph therefore shows the trend since 2001 and the range of the UKCIP02 projections (still with the caveat about whether a straight line warming expectation is strictly correct). It’s still not looking good, is it? There is, of course, a great deal on interannual variability in the data, so I guess they might argue that all is not lost, but nevertheless, you might think that the latest set of predictions, UKCP18, might be quite cautious on temperature predictions. "Summer temperatures could be up to 5.4 °C hotter by 2070, while winters could be up to 4.2 °C warmer." They give an even higher figure for summer temperatures in Wales. That means that summer temperatures are going to increase by over 0.1 °C per year, up to four times faster than the rates they predicted in UKCIP02 and which already look to be overstated. 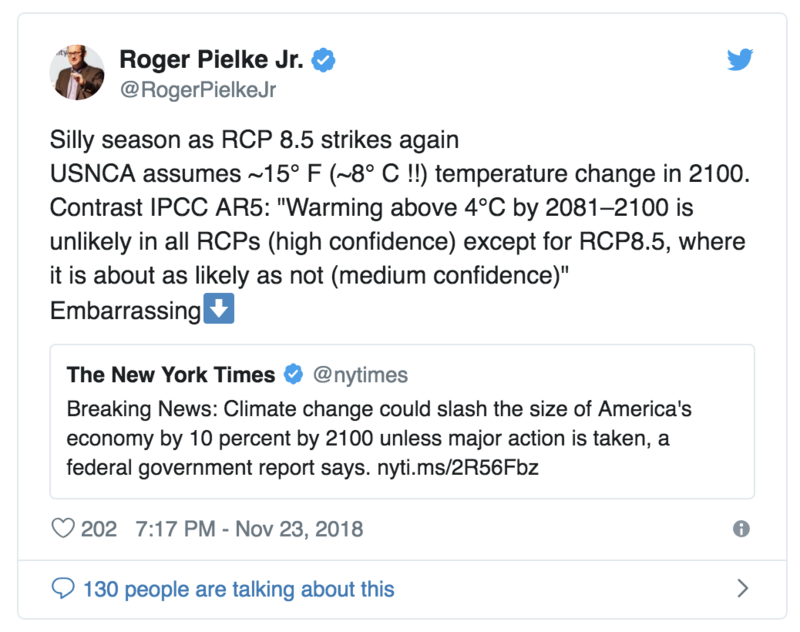 “By presenting cherrypicked science, at odds w/ NCA Vol,1 & IPCC AR5, the authors of NCA Vol.2 have given a big fat gift to anyone who wants to dismiss climate science and policy,” Pielke Jr. wrote in a tweet Friday shortly after the White House released the report. A White House statement Friday said the report was “largely based on the most extreme scenario” of global warming and that the next assessment would likely be more balanced. Pielke agrees. He says the NCA’s second volume relies on the RCP8.5, one of the four possible pathways in the trajectory. 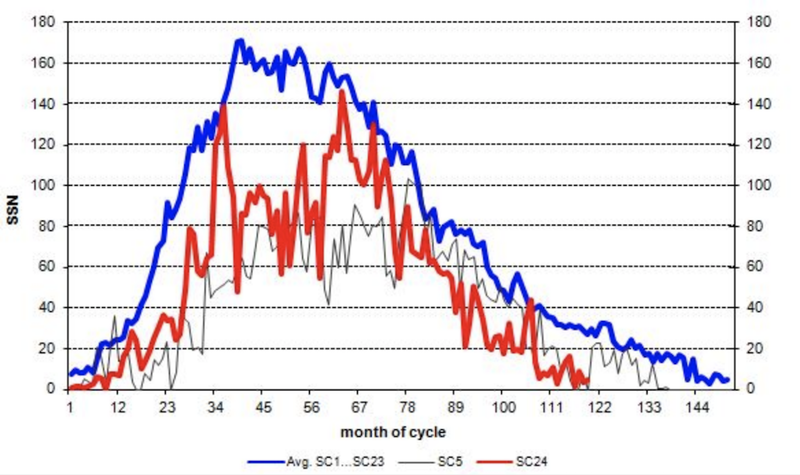 This particular pathway is slowly being phased out of the IPCC’s modeling because scientists believe the model likely overestimates future supply of fossil fuels. Researchers used the most extreme example possible to sell the narrative that wildfires will get worse, he noted. Although the most violent — and deadliest — demonstrations have taken place in Paris, protests are being held country-wide over a proposed increase in France's "fuel tax" designed to curb fuel usage and cut down on carbon emissions to prevent "climate change." French President Emmanuel Macron is pushing the tax to help cut down on the country's dependence on fossil fuels and to "fund renewable energy projects," according to the Associated Press. "The anger is mainly over a hike in the diesel fuel tax, which has gone up seven euro cents per liter (nearly 30 U.S. cents per gallon) and will keep climbing in coming years, according to Transport Minister Elisabeth Borne. The tax on gasoline is also to increase four euro cents. Gasoline currently costs about 1.64 euros a liter in Paris ($7.06 a gallon), slightly more than diesel," the AP says. On Saturday, thousands of protesters, clad in the bright green safety vests all Parisians are required to keep in their car for emergencies, set fire to barricades in a massive bonfire near the famous Arc de Triomphe, and waged a campaign of destruction along Paris's main shopping and dining thoroughfare, the Champs-Élysées. More than a dozen people — including one police officer — have been hurt in the melee, and one person has been seriously injured. More than 3,000 law enforcement officers have been deployed to contain the situation and enforce "no-go" zones around government buildings and in heavily trafficked tourist areas. Julie Griffiths* bought her wanted to reduce her carbon footprint by installing solar panels. The cost would have been a prohibitive £12,000, so she signed a deal to lease part of her roof to a solar power company, which would fit the panels for free. It would pocket the newly introduced feed-in tariffs (FITs) – subsidies paid by the government for the electricity generated. She, meanwhile, would have lower energy bills. At the end of the 25 years, the panels and the tariffs would be hers. Government subsidies on solar panels will cease at the end of next March. Miss the deadline and it would take a working household up to 70 years instead of the current 20 to recoup the average £6,500 cost.